Our Authentic 19th Century Copal Painting Medium Be aware, this is not an alkyd-based "Copal" medium. There's no alkyd in it! Nearly every so-called "copal painting medium" being marketed to artists today is not based on actual copal varnish. Nor do any of these imitations perform like the original copal medium so favored by the great painters of the 19th Century. True copal varnish does not behave like alkyd varnish. Ttrue copal varnish noticeably congeals normal commercially-made or studio-made oil paints. This congealing property also applies to the painting medium conjured through use of that true copal varnish. Again, alkyd varnish does not have that congealing effect. Both of our 19th Century Copal Varnishes offer this congealing attribute; and so either can be used to make this treasured painting medium. The recipe is not 'set in stone' but, again, this is the classic formula used by so many 19th C. masters. 1-part of our own 19th Century regular or Drying Copal Varnish is first combined with an equal part of turpentine spirit, the whole is then shaken for incorporation. After combining the spirts with the varnish then the oil can be added in.-- do not add the oil without first adding the spirits! Shake well and the medium is done. If you have a bottle with a drip-cap then that will make the medium very handy for use. The use of the Drying version of our copal varnish results in the paint being dry and ready for further layers on the morrow. 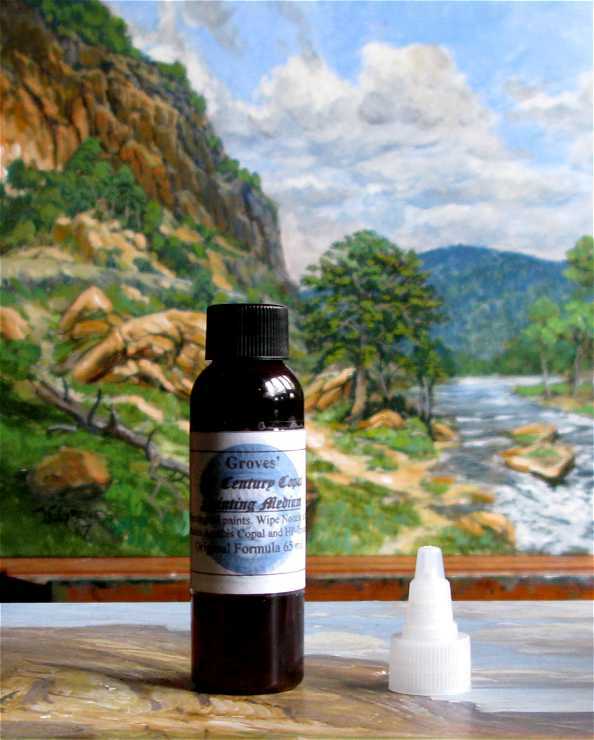 We offer this Copal Painting Medium in either the fast-drying version or the slow-drying (which allows the paint to be applied over two-three days).This effect of adding this copal medium to oil paint closely resembles adding meguilp or other "jelly medium" to the oil paint. The engendered surface is quite like the 'clever' brushwork produced by masters such asAlbert Bierstadt, or Jasper Cropsey, or Thomas Moran. 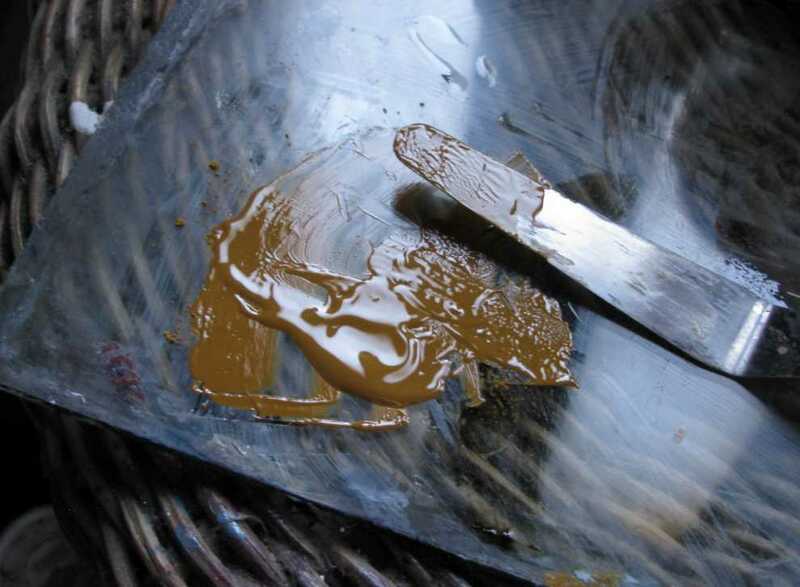 (1) One part of our 19th Century Copal Varnishes--If a fast-drying (overnight) medium is desired, choose the 19th Century Drying Copal Varnish, which has been cooked with a drier added. (2) One part of a solvent, such as Gum Spirits of Turpentine or D-Limonene. The use of mineral spirits (common "paint thinner") may not work, though it can be used to thin-down the treated oil paint. 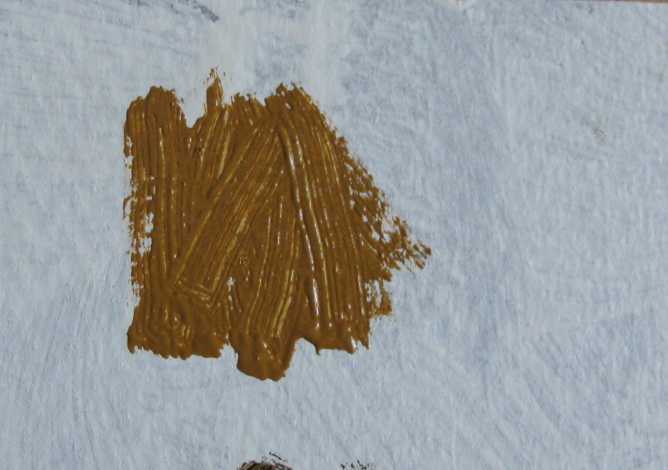 In typical practice, the dry pigments are stiffly rubbed-up with a normal painting oil; then given a few drops of the Copal Painting Medium. The copal medium is mixed well with the paint, causing the paint to soften but remain thixotropic, meaning the paint still captures and retains the stroke of the brush. There is no slumping or leveling as one might expect with the use of regular oil (especially standoil) or the typical modern-day alkyd painting medium. The treated oil paint is soft and facile in application, yet it retains the impression of the brush-hairs where desired; or the surface can be smoothed via brushing-over. This effect of retention allows the oil painter to construct and cover the work with a masterfully stated surface, whereby the paint can be made to imitate the physical structure of the objects portrayed, no matter if the object is smooth or textured --however the brush or knife leaves the surface then that is how it will remain through the curing; and with no induced wrinkling. 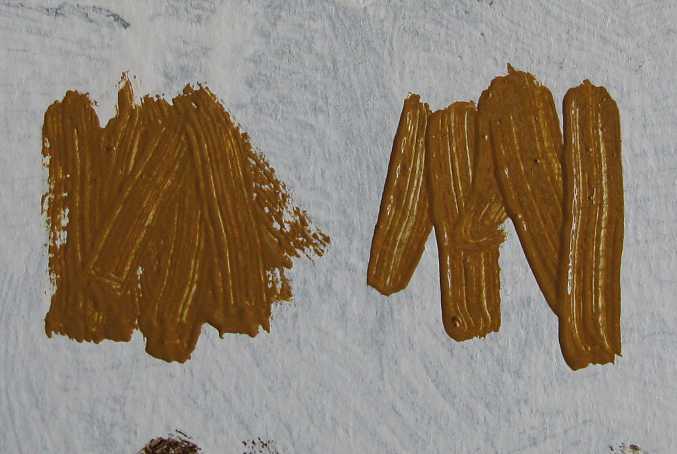 Visual Dmonstration Showing the Copal Painting Medium's Thixotropic Effect on Basic Oil-and-Pigment Paint. The following images demonstrate the effectiveness of this traditional paintng medium. Again, no modern-day alkyd mediums will perform in this manner. 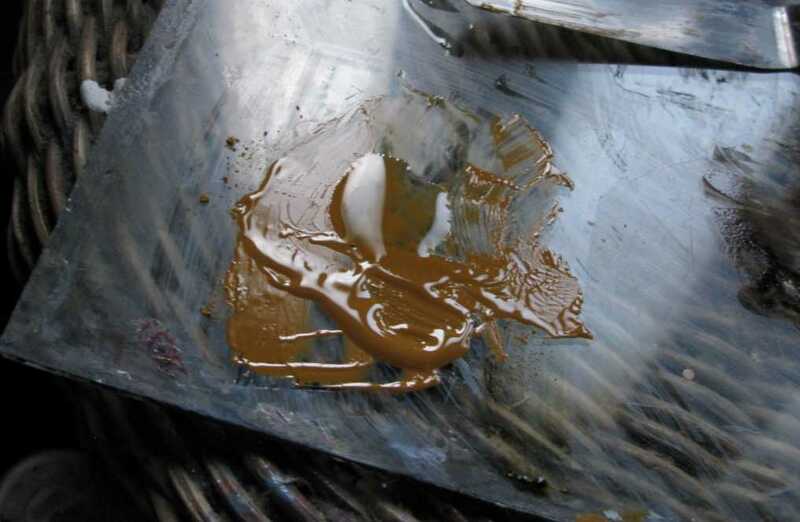 The first image shows yellow ochre pigment about to be rubbed-up with linseed oil on the edge of a glass palette. The instrument for this task is a simple palette knife --which is quite contrary to the much-touted notion that a slab and muller are necessary to make perfect oil paint.. The paint is made and has the typical ready-to-apply consistency of heavy cream. This is not 'lean' paint; it is 'fat'. If applied too thickly this paint will wrinkle as it 'dries'. BTW, this is the same oil paint as was common to the 19th C. and well before. 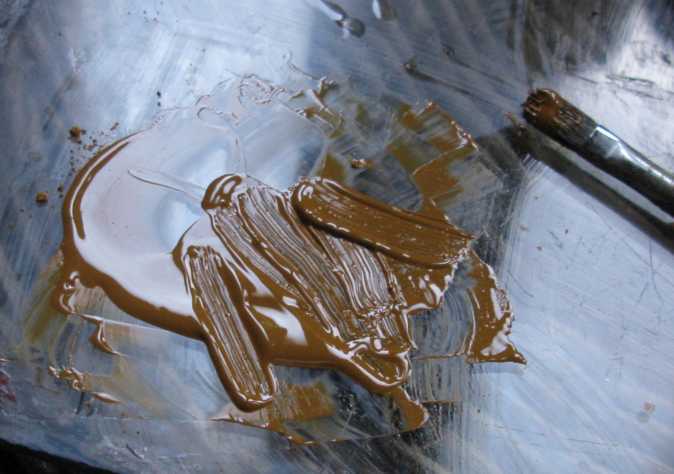 Upon application, this paint is tendant to slumping and can sometimes 'run' down the easel-bound support overnight. It has limitations but is example to the common notion that 'simple oil-and-pigment paint' is all that is necessary towards exemplary oil painting. In the next image I have applied this same oil paint to the sealed and smooth support. Facility is awkward and there is a noticeable skip when the brush is moved quickly. I had to go over the surface to cover uniformly. Succinct 'notes' are difficult to achieve. Adding in some 'paint thinner', such as gum turps spirit, will somewhat remedy application and allow further advantages but the paint levels even more. 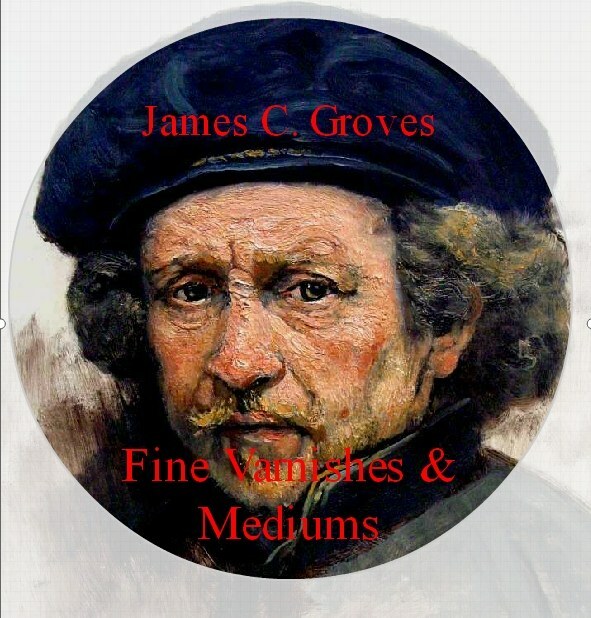 Clever, 'masterful' brushwork is not attainable. I have now added three drops of Copal Painting Medium to the same paint on the glass. Below: After thoroughly incorporating the liquid copal medium into the paint there is now a noticeable gelation effect. On application to the same sealed ground the now copal 'tempered' paint moves easily but then freezes in its place. The stroke can be applied succinctly, distinctly and without 'fussing'. As the yellow ochre paint is now further reduced but gelled (thixotropic) it will be optically brighter due to its relative transparency/ translucence. Facility in application is excellent. The edges show a pronounced and upstanding character as more rheologic elevation is apparent. This is clever brushwork, exhibiting the track of the brush. Wrinkling will no long occur upon solidification. Such is the ability of true natural copal resin 'cooked' knowingly into an oil. Alkyd resins will not allow this. 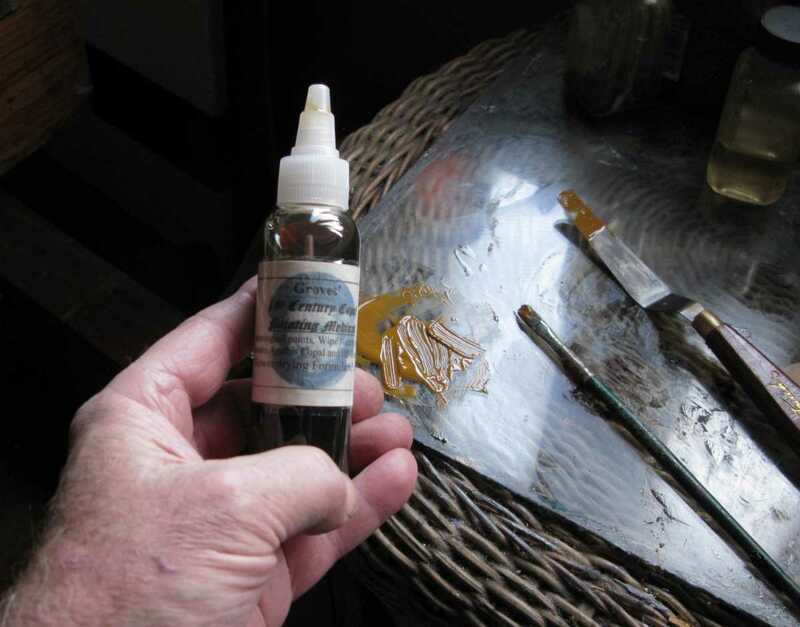 During a painting session, the turpentine will slowly evaporate from the applied paint, which allows easy "build" -- the application of additional paint-superimposed atop the initial paint. For lines and such things as tree-branches, the brush is dipped in solvent then stropped into the treated paint to thin that for application. Further instructions for use are included with the medium. Caution: This copal-based medium in its bottle may be thinned with additional turps, spike oil and D-limonene, but not mineral spirits (MS). 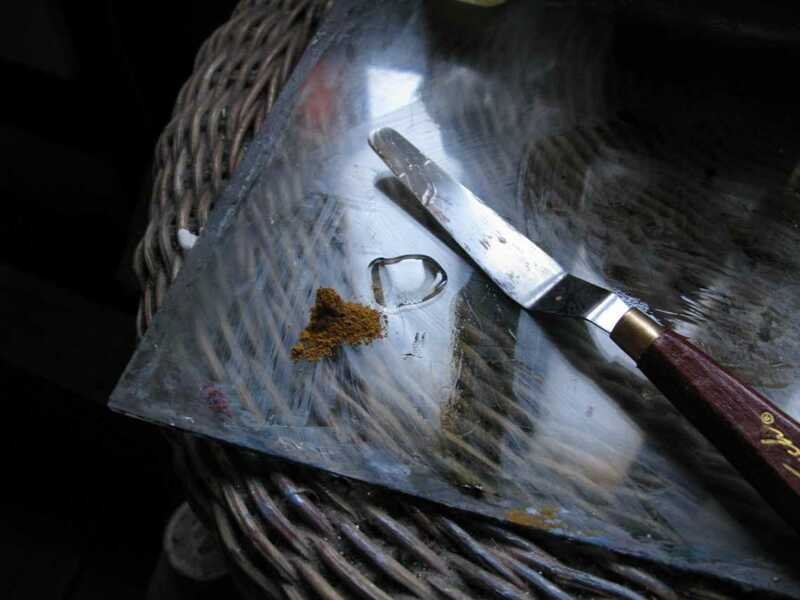 If use of MS is desired, simply add the Copal Painting Medium to the paint first; then the treated paint can be diluted with MS.
Copal Painting Medium should not be used by those who have a problem with breathing or other exposure to gum spirits of turpentine!